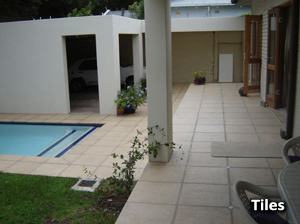 Our tiles have been tested by the SABS (South African Bureau of Standards) and passed all the average requirements for resistance, shrinkage, expansion and traverse strength. Tiles are made in 2 finishes indoor and outdoor. 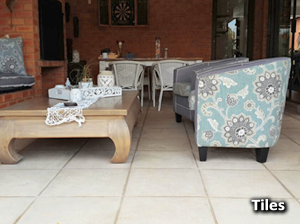 Indoor tiles are a smooth finish, while the Outdoor tile is rough. The colour of our product is not a surface layer but is consistent right through out. If the Tiles are installed internally, tile adhesive is an option. If it is installed externally, we recommended that it is applied to a topping of sand and cement approximately 30mm thick and fixed with a cement slurry. 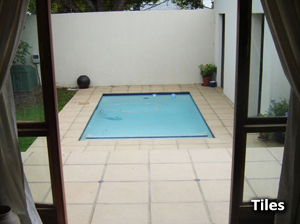 All tiles should be installed onto a concrete slab or base. Lacotta Grout is made either to match the Tile or in a standard gray. Grouting lines are approximately 10 –12mm thick. Lacotta Tiles are cement based and are porous and need to be sealed with a base coat. 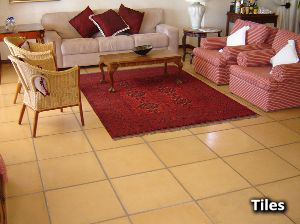 We recommend indoor tiles be sealed again with a topcoat. The maintenance of this sealer depends on the quantity of traffic passing over them, generally a minimum of 3 to 5 years is expected before stripping and resealing is required. The resealing process can be repeated a number of times making the Lacotta Tile timeless. As with all Lacotta products, Lacotta Tiles are handmade. Lacotta also makes various Tile Extra’s to compliment any design including copings, bullnose copings, tozzeto’s etc. please view them in Tile Extra’s.